Our Bazi investigation into the forces governing the events in people’s lives has brought to our attention the existence of a six year “power run” of the psychic (chi) water force. 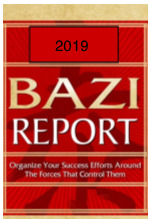 Our Bazi report for your chart for the year 2019 will show you the opportunities (family, wealth, success, health, etc.) that this force will bring to you for this year and the next, and how to enhance your water chi to sustain your efforts through the following four years, enabling you thus, to enhance your well being (wealth, health, family, etc.) moving forward.